Do you sometimes wish you could just absorb knowledge while you slept so you didn't have to study? The closest you'll probably get to that is through Pillowcase Studies' awesome pillowcases. Each pillowcase has awesome need-to-know facts about your major (in cute fonts!) These pillowcases are perfect gifts for anyone going to college, or just for yourself to keep you motivated to love your major and as a chic way to decorate your bed. What's even cooler about Pillowcase Studies is that it was founded by a young twenty-something entrepreneur! Since my major was in psychology, I got a psychology pillowcase that I put on my bed immediately. The pillowcase itself is white with black print, and is both soft and big enough to fit some of the largest pillows. Not only does it make for a cute addition to my bed, but it also makes sure that I won't forget some crucial facts I learned in class. My friends who also majored in psychology are jealous. 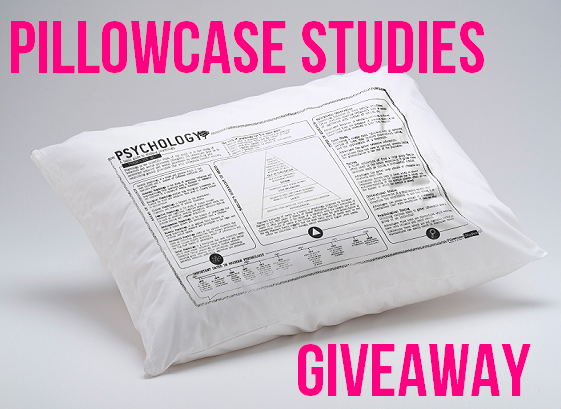 Now you can win a pillowcase from Pillowcase Studies! All you need to do is visit Pillowcase Studies and comment below with your favorite major from the Pillowcase Studies collection. For an extra entry, like us on Facebook. If you can't wait and want to get your own pillowcase, head on over to Pillowcase Studies or visit their Facebook page! I love the drama pillow case. Although, I hear there is also a music theory pillowcase coming soon and I can't wait for that one as well seeing as I'm a vocal performance major. I love the stage and good music! This pillowcase is like Jesus, wait. better. Pillowcase studies strikes again! This new, indomitable business is everywhere. This fad is viral: it's the next big thing. I love my Drama Pillowcase study!!!! I like the Art History pillowcase.It's not everyday you find mass produced items geared towards the arts. I love the Biology pillowcase! It's so cute and would be the perfect present for my future-doctor boyfriend! i love the psychology and biology pillowcases! but they're all so cute! I love the Principles of Psychology Pillowcase! It's adorable and perfect for how much of a nerd I am. this is the smartest idea! its also a great way to calm nerves before a test because all you have to do is read your pillow. I am definitely going to buy one especially the psychology one since I changed my major to that.